- Leave Kakariko Village through the north. Wander east, past the Sanctuary, and then south through the rock field. Once you reach grass again, curve around to the right and then back north. Now you're on Eastern Palace territory. Don't neglect to enter the cave near the entrance if you're feeling down, as a Great Fairy is waiting inside. - To the east of the entrance is, at this point, more or less an extensive dead end. Don't bother going there just yet. - Climb the first set of stairs to your right. In an alley a little more to the right and up north you'll see a rupee flanked by two statues. These will come to life and attack you if you try to pass through them. Easy to beat, just worth noting. - Climb the main steps and check out the door in the north. Note the conspicuous signs. Hmmm. - Ravio will ask you a question when you get back. Answer with the bow and arrow symbol. - Ravio will give you the Rented Bow. Note the word 'Rented' in there, because it will come back to haunt you if you die. Note, too, that the Bow uses a magic meter of sorts rather than a set number of arrows. This allows for unlimited shots, but you'll have to wait for it to recharge. - Back to the Palace. 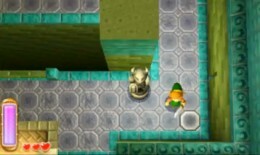 Stand atop the pedestal near the locked door flanked by Ravio's signs. Shoot the two dimmed crystals here to open the door. - At the bottom of a pit beyond is a small building. You can't get into it via the front door, really, so don't bother. - Check the northwest corner of this courtyard, on the walkway above the building. Stairs lead up here to a ledge, watched over by more living statues. Kill them and to the east you'll find 20 rupees in a chest. - Hop down and head south. Follow this path up the bluffs, beating off enemies as you go, until you find the entrance to the interior of the Eastern Palace. Now the fun begins. Listen to Osfala boast, save at the weather vane, and head inside. - You'll start in a room with a door in the east and a door in the west. South of the eastern door is a conspicuous floor tile. Step on it to open the door ahead. You'll find a few rupees beyond. Be careful not to fall into the pit. - Back to the first door. Beyond the central pit is a crystal you can hit with an arrow. Doing so opens a northern path. - Follow it two screens to a room filled with rolling iron balls. Weave between the balls as you head north, hiding in niches if any huge balls come along. Once you're past the balls, you can sweep to the left and back south to find some rupees (and a trap which will knock you back into the ball corridor) or simply go through the western door. - Beyond is a battle with a few squidy things. Very easy. Killing them will make a chest appear, though you can't reach it. Head south through the next room and up the stairs to reach the chest, which contains a Compass. The Compass displays the location of this dungeon's boss. - Head back south and look nearby for another conspicuous floor tile. It will open the door to your right. Before going through, though, return to the room with the chest and approach the north end of the raied platform it's on. There's a hidden passage leading into a small area with another floor switch. It will reveal a chest containing 20 rupees. - Return to the ball room and walk across the mesh bridge over the ball corridor. North of two statues is another switch which will open the door on the east wall. Beware, as hitting it will bring one of the statues to life. - Beyond this door is a room with a rising platform. To the left of it is an orb switch on ground level; to the right is an orb switch on a raised level, reached when the platform rises. Hit both with arrows as quickly as you can, then run north to get at the chest which is now within reach. It contains a Small Key. - Leave through the top door. Use the Key on the locked door in the ball room. - You'll come out in a room with a button. Step on the button after charging up your sword attack and four statues will come to life. Use a whirling attack to drive them all back, then wipe out any survivors with quick strikes. After they're gone you'll open up a warp returning you to the beginning of the dungeon, which is handy for saving. - ... you'll find a room full of rolling iron balls. Run west to find a switch, and stand on it until the nearby stairs have fully cycled into existence. Run up them while they're moving back into the wall, run across the walkway when there's no giant iron ball in your way, and run south to see another floor switch. Standing on it reveals another switch, which will unveil a chest containing more Monster Guts. South of the chest is another switch which will open the door into the southern room. - Either way (preferably both), you're now in a large, southern room. Approach the huge door in the middle and shoot the orb to your left to make a nearby platform move, then head to the left side of this triple-pronged platform and shoot diagonally up and to the right to hit a second orb. This will open a door to your right. Hop down beside this orb and shoot the one on ground level next to it to make another platform rise and fall. Use it to get into the door you just unlocked. - Hop on one of the rotating platforms in this room. Use your Rental Bow to activate the four orbs in the middle of the room. Watch out for trap arrows as you move around the central platform. Once all four orbs are activated you'll unveil a chest containing a Small Key. - Return to the large, central room and use the Key on the locked door in the west. - Inside this room you'll be treated to a battle with some skeletal warriors. They like to leap away from your sword swipes, so you can kill them either by cornering them or using arrows. After killing all three you'll unlock a huge chest containing a Big Key. Ooooooooo. - Before charging straight to the door, go up the stairs in the south of the chest room to find an orb. It unlocks another orb in the southern room of this floor. Stand on the rising and falling platform for a clear shot; this will open the way to the boss' room. Save if you feel anxious, then step inside. Woo, first boss fight! This one isn't too bad. 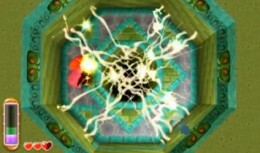 Yuga has two attacks: he'll either summon three soldiers to attack you or he'll unleash a four-way lightning bolt attack, the latter of which is telegraphed by lines through the room. You can easily bypass these attacks by immediately shooting across the room at Yuga with arrows. Once he's down, rush in with your sword and do some swiping. Yuga likes to retreat into the walls as portraiture occasionally, but it's pretty easy to follow as he moves around. - Once the scene is completed, you'll gain access to the special ability of Ravio's Bracelet, which allows you to temporarily merge with walls. Cool. Grab the Heart Container, then use this ability to slip through the crack in the wall and reach the outside of the Eastern Palace. - Head right along the wall to emerge on the western edge of the Eastern Palace. Use your weird portraiture ability to make your way down, merging into walls to escape disappearing floors and to cross moving barriers. Look for cracks in the walls that you can slip through to proceed. Go north along the wall from the first such crack, before slipping through, and you can find a chest containing 50 rupees. You'll soon wind up back on the first floor, and, then, outside the dungeon. Huzzah! - Once back outside some crazy doins will transpire, and you'll be outside Hyrule Castle. The Charm will turn into the Pendant of Courage, and you'll have a new quest: finding the other two Pendants. Sounds like a plan. Once you have the Pegasus Boots, check out the rock field to the west of Eastern Palace. Sitting atop the right-most rock in this field is a Maiamai, just waiting to be dashed off of its perch. Also once you have the Pegasus Boots, check out the line of five trees south of Eastern Palace. If you dash into the far right tree you'll find another Maiamai. Check out that little building you couldn't access earlier, southwest of the main building of the Eastern Palace. You can slip past the bars by merging with the wall. Inside you'll find a path of moving cubes. 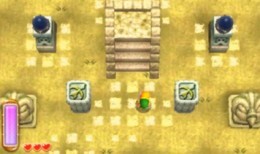 Merge with the cubes and make your way up to the treasure chest, which contains 100 rupees. It's a fairly simple matter of careful timing and coming out of merged state over ground to get to the top. Merge with the wall that comprises the foundation of the ground the Eastern Palace's main building is sitting on. Walk north to reach a treasure chest containing 100 rupees. 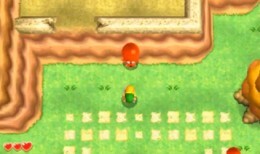 Merge with the wall north of the four posts blocking 100 rupees in the south of the Eastern Palace grounds. From here you can reach a Maiamai. In the south, on the path leading to Lake Hylia, is a tree with a Maiamai sitting atop it. Dash into it using the Pegasus Boots to bring the critter down. Near the Palace's entrance on the west side is a solitary rise in the land with a chest on top. Use the Hookshot to launch over to it, via a wooden pole, and you'll net yourself 20 rupees. With the Power Gloves equipped you can access the eastern-most ramparts of the Eastern Palace by tossing aside some rocks. Look for a bundle of boulders to blow open with a Bomb and you can merge your way over to a Heart Piece in the resulting cave. Head one screen south of the Eastern Palace, to the canyon area just north of Lake Hylia's northeastern boundaries. There's a fenced in Heart Piece here that you can get at with the Hammer. Three steps north of it is a cave you can blow open with a Bomb to find a fairy fountain. Merge with the cliff near the entrance to this area and make your way south along the western wall. It leads to a cliff edge where you'll find a large rock. Heave the rock out of the way to find a Maiamai.